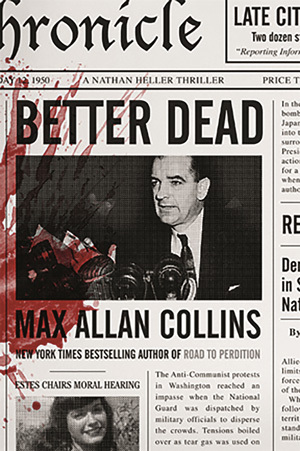 The first Nathan Heller novel in three years, BETTER DEAD takes a step back in time from the JFK Trilogy (BYE BYE, BABY; TARGET LANCER; ASK NOT) to deal with the events of the Red Scare-era 1950s. This book has been coming for a long time. It’s one of the projects that got set aside when it came time for Heller to make a comeback after about a decade away. To get Heller back out there, I proposed the Kennedy trio, a good bet for a sale because of the high-profile nature of the material; a trilogy with Marilyn Monroe, Jack Kennedy and Bobby Kennedy was appealing. But it meant skipping several things I had planned to do, including a Robert Kennedy/Jimmy Hoffa book that I hope eventually to get around to. With BETTER DEAD, the tricky thing is that I have two cases for Nate to deal with. Neither seemed right for a single book, but together – with the shared era and a number of common characters beyond Heller himself – the whole just might exceed the sum of its parts. Joe McCarthy is one of the characters – and factors – that joins the two stories: the Rosenberg “atom spies” case, and the Frank Olson murder. The latter has to do with the Army scientist who was dosed with LSD at a CIA retreat, which had unfortunate results. Heller is working on the East Coast exclusively this time around – he’s just opened a branch office in the Empire State Building – which puts him right in the heart of Mike Hammer’s world circa 1953. Heller has always had things in common with Hammer, but this time – in this setting – those commonalities come out more prominently. In fact, as the guy completing the Hammer stories from Spillane’s files, I several times questioned whether I’d slipped out of Heller territory and into Hammer. And is that a bad thing? Certainly wouldn’t be the first time. On the other hand, Heller’s victories can never be as complete as Hammer’s. Others in the cast include Bettie Page, Dashiell Hammett, Roy Cohn, Bobby Kennedy, and Sidney Gottlieb (the CIA’s Dr. Feelbad). It’s a wild one. Watch for it May 3rd. Check out this cool QUARRY’S LIST review. MURDER NEVER KNOCKS is a Pierce’s Pick this week! Here’s a nice review of QUARRY’S DEAL. And here’s a somewhat late-in-the-game review of DEAD STREET. Antiques Swap — Collect it! 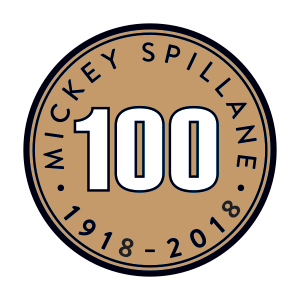 The latest entry in the Trash ‘n’ Treasures series (usually referred to as the ANTIQUES series) hit the bookstores last week. Barb and I (the co-authors, as “Barbara Allan”) spotted ANTIQUES SWAP nicely displayed in the Davenport Barnes and Noble. 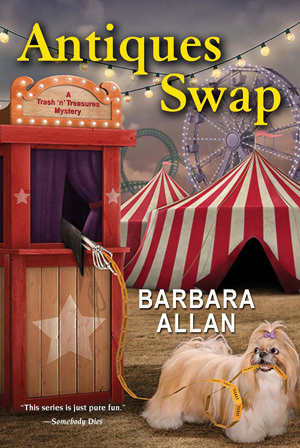 This one begins at a swap meet but actually touches upon other, more risque meanings of “swap,” in a plotline we feared might be frowned upon by our editor, though we got away it. Cozies are supposed to be…cozy. The murders are supposed to be…nice. But for all the humor we put into the books – and we put a lot in – we try not to take homicide too lightly. We also realize that our audience may include some readers – possibly you – who don’t regularly read cozy mysteries. After all, the great reviewer Jon Breen has called us a “subversive” take on the form, which he meant as a compliment. When we created the series, and were asked to include certain elements (exotic setting, cute pet, gimmick premise), we did so in an overtly tongue-in-cheek way that we thought would get us rejected. Ours are definitely in a sub-genre of comic mysteries. We don’t, however, consider ourselves to be spoofing the form or doing satire. Just as we take the murders in the stories seriously, we take our two main characters seriously and follow them through problems and challenges in their lives. Vivian Borne, Serenity’s theatrical diva, may seem larger-than-life, but I’ve met her at various times in various forms. You probably have, too. Of everything I work on, the ANTIQUES series is the one that maintains the most constant presence. That’s largely because Barb spends almost all of her writing time on it. Of late we’ve been doing a novel and a novella every year, and that keeps her in production all but a few months in the summer. So we’re discussing the stories pretty much year-round. Also, the nature of the book business is that once you’ve “finished” a book, you’ve just begun – a copy-edited manuscript will roll in unannounced for you to check through (and we both have to do that), and then galley proofs (which we both have to deal with). These never arrive at a good time, and always are due yesterday. Barb and I had barely finished next year’s ANTIQUES FATE when the upcoming novella, ANTIQUES ST. NICKED, arrived in galley proof form. She’s gone through it already. I haven’t yet. In the meantime, I continue work on THE BIG SHOWDOWN, the sequel to the current THE LEGEND OF CALEB YORK. I admit to feeling something of an imposter, as I have read precious few western novels in my time. On the other hand, I love movie westerns and have a huge collection of them on DVD and Blu-ray. I’ve said here many times that MAVERICK was my favorite show in childhood (and still ranks high) and that the episode “Shady Deal at Sunny Acres” is the greatest hour of episodic television ever…an opinion that hasn’t changed. While working on CALEB, I have subjected Barb to a festival of western movies…but “subjected” really isn’t right, because loves western movies, too. Right now we’re in the midst of a Joel McCrea festival. I rank McCrea in the upper reaches – in the top five western stars (John Wayne, Randolph Scott, Audie Murphy and Gary Cooper being the others). Regular readers of mine know I am an Italian western fan, since Nolan was largely based on Lee Van Cleef’s screen persona in those films. What I find really difficult in the CALEB YORK novels is balancing the myth with the real west. Despite my reputation for historical accuracy with the Nathan Heller novels, I am much more interested in the mythic west than the real thing. THE LEGEND OF CALEB YORK seems to be a little tough to find in bookstores, so I recommend you order it online. It’s already in a second printing. Incidentally, while writing ANTIQUES FATE – which touches upon the British school of mystery writer – we spent our evenings in a festival of UK crime fare, leaning heavily on MIDSOMER MURDERS and the new Blu-rays of the great Joan Hickson as MISS MARPLE. This terrific ANTIQUES SWAP review just came in from one of our favorite writers (and favorite people), Bill Crider. My writer pal Ed Gorman used this review of the Dover reprint of STRIP FOR MURDER at his terrific blog. The QUARRY series gets great play in this article about Memphis trying to lure the series back there (it’s shooting in New Orleans currently with limited Memphis footage scheduled to be shot later). A recurring cast member has been added to the QUARRY series. Here’s another of those articles about movies you didn’t know were based on comics, with ROAD TO PERDITION included. But either I am getting very old or the world is getting very young when such movies include ANNIE and THE ADDAMS FAMILY (!!!). 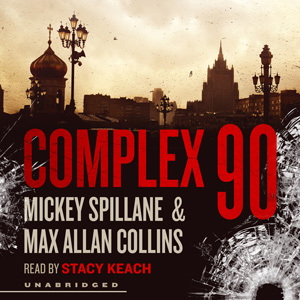 And finally, of all things, here’s a review of the audio of DEAD STREET, the first Spillane novel I completed (though I took only limited credit for my polish and concluding chapters). Posted in Message from M.A.C. | Comments Off on Antiques Swap — Collect it!